Since 2004 Bar Rail Mats powered by The MRL Group has been a leader in designing and producing custom bar rail mats for many liquor and beer brands. Bar Rail Mats powered by The MRL Group specializes in sales promotional materials and point of purchase displays that will get your company noticed. Our team of experts is equipped to design and produce any bar rail mat project, back bar displays, tap handles, metal tacker sign, wood display, mirror, wood flight display or any other promotional project. Bar Rail Mats powered by The MRL Group guarantees our customers high quality products and superior service. Bar Rail Mats powered by The MRL Group is a self started independently owned and operated full service promotion advertising agency. 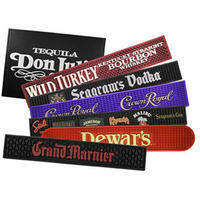 Bar Rail Mats powered by The MRL Group specializes in designing and producing custom point of purchase displays. Bar Rail Mats powered by The MRL Group is capable of producing a wide range of bar mats in a variety of materials. Beer, wine, and liquor companies trust Bar Rail Mats powered by The MRL Group to produce exceptional products accompanied with superior service.